Indiana and Alabama have added the Drivewyze PreClear weigh station bypass service to 10 new locations while 12 more sites have been added in Texas, bringing the total number there to 18. Drivewyze leverages cellular networks and the internet to add transponder-like functionality to tablets, smartphones and select electronic on-board recorders. Unlike traditional methods that use dedicated short-range communication transponders in every truck, Drivewyze doesn’t require the installation of additional equipment. The Drivewyze PreClear weigh station bypass application can be used on Android and iOS-based tablets or smartphones, and is integrated into PeopleNet Blu.2 and Tablet devices, and the Zonar 2020. Rand McNally and Drivewyze recently announced an agreement to provide the Drivewyze PreClear weigh station bypass service for Rand McNally’s suite of mobile fleet management devices. 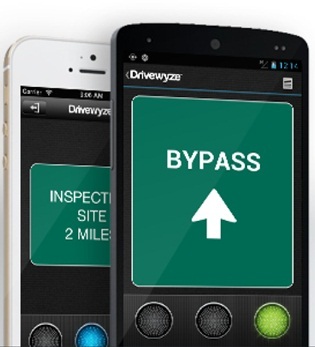 Drivewyze PreClear 3.0, the newest version of the weigh station application, comes with Weigh Station Heads Up service for real-time notifications for more than 700 weigh stations and inspection sites nationwide. A map with all of the currently active weigh stations across the country is available on the Drivewyze website.